My best friends and I drove a '60 Chevy from Albuquerque, New Mexico to Mexico City, Guadalajara and Acapulco during winter break in 1967. Not only did I turn 18 on the trip, but my bff's were all guys: Arturo, from Juarez; Donald, from Española, NM; and, Hugo, from Venezuela. We liked to dance salsa in the rec room of the girl's dorm. I accepted the invitation to join them on the road trip without hesitation. My first adventure as an adult was about to happen. Before your imagination goes dark, or brightens with anticipation, you should know that I left Albuquerque a virgin and returned intact. The sexual revolution was in full throttle and the Pill was readily available. But I wasn't. I had more important matters on my mind, like planning my wardrobe for the trip. I wanted a bikini, but couldn't find one in Albuquerque. No worries, we were going to Acapulco! What better place to buy my first bikini? The itsy-bitsy-teeny-weeny bikini hadn't hit the fashion pages yet; bikinis were more like hip-huggers. In those days, I was thin and flat-chested so I cut up a padded bra and brought along large safety pins to secure the cups to the inside of the top. 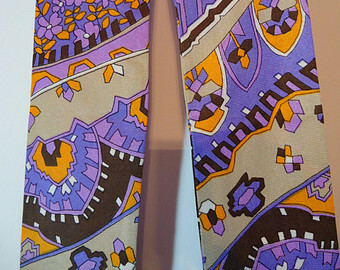 Part of my meager savings also went toward high fashion-purple wide-leg lounge pants, a matching top and a head scarf which could be tied around my hips. Far out! In the '60s, the roads in Mexico were not all paved and there were few signs indicating which way to go. One moonless night, we got behind a bus with a sign saying it was heading for Mexico City. We ate its dust all the way into the smoggy capital, checked into a youth hostel and slept soundly until the city awoke with a clamor I'd never before encountered. No matter; I was traveling and took it all in hungrily. Speaking of eating, I also ate everything the guys ate and drank the water without hesitation. That first day, we visited the Museo Nacional de Antropología, which was just like the National Geographic pictures I'd lingered over as a kid. Of course we traveled out to the Teotihuacan Pyramids. We took the next available bus heading to the pyramids. Our bus gave us a villager's view of the back way to get there. We exited the paved highway and traveled on a dirt road where there was the occasional mud hut. A naked toddler exited one and pooped in front of his home. A man sat nearby smoking a cigarette. An industrial building sat alone in another section. It had a chain-link fence around it and the only sidewalk in the area running along the front. The yard was dirt. An old woman swept the sidewalk clean, but the bus churned up dust as we passed. She reached the end of the sidewalk, turned and swept in the opposite direction. 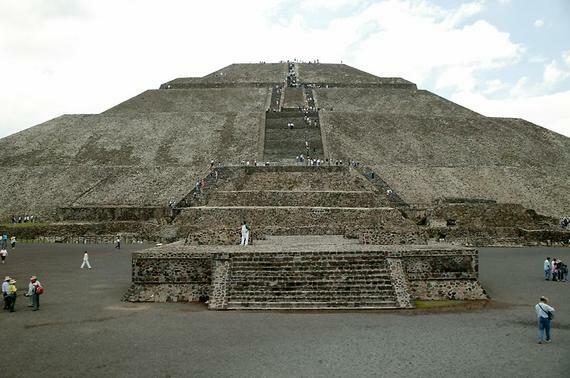 At last, we reached Teotihuacan. We raced up the steps of the Pyramid of the Sun and raised our arms to the sky in youthful triumph. Next stop: Acapulco and my new bikini. The skies cleared, but the day grew hot and muggy. There was no air conditioning in the car. We stopped to buy tacos and fruit from a street vendor. Across the way, children frolicked naked in a stream. Hot and sweaty, I joined them in shorts and brought along a bar of Dial soap. It was refreshing to be clean again. I was clean, wasn't I? 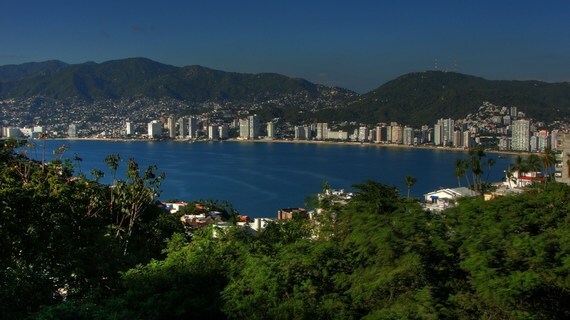 In Acapulco, we stayed in a beautiful hilltop hotel. The guys didn't want me to go anywhere alone, but I insisted on shopping without a male chaperone. On the walk back to the hotel, two boys about my age headed in my direction. As they passed, one of them grabbed my crotch. I screamed and swung my bag with the bikini at him. They laughed and walked on, slapping each other on the back. My adventure buddies shook their heads and tsk-tsked at the risk I'd taken. They were in love with me and I was in love with their love. Undaunted, we danced that night at the Tequila a Go-Go. Yes, I am so old I danced at the precursor to disco. At around 4 a.m., we loitered on the curb outside the club and my friends befriended a taxi driver. The cabbie promised us something unusual. We piled in and he took us far out of the city. We traveled on an unpaved road to an unlit area. In the distance, dim light outlined crudely assembled shanties. People -- male tourists -- roamed a rutted lane with the structures on either side. Women sat outside the huts and beckoned us in. Light seeped out through gaps in the walls of the tiny casitas. There were no street lamps or power lines visible so the light must have been from candles or kerosene lamps. Tall, blond Nordic-looking men dressed in tennis whites peeked through the gaps at what was going on inside. I sat in the middle of the back seat of the taxi with Donald and Hugo on either side of me. Arturo sat in the front seat next to the driver, who slowed so that we could see what was offered. A middle-aged woman beckoned us with a graceful sweep of her arm. The taxi paused. She lifted her skirt and spread her legs wide. In unison, without consulting one another, every guy in the taxi except the driver pressed the lock button on his door. Ha! My friends were innocents, too. The sun was coming up when we returned to our lovely tiled rooms high on a hill overlooking Acapulco Bay. Sleep mattered little, but we managed to sneak in a few hours before heading to Revolcadero Beach, where thunderous waves pounded into shore. I had never bodysurfed in my life. Nevertheless, I swam out with my pals. A high shimmering wall of water towered over us. I dove into it as the guys had instructed, fully expecting a pleasant ride to shore. The water seized me and curled my body into an O, spinning me in circles until it spit me out on the beach. I stood as the water withdrew and looked down at my bikini. My padded inserts still clung to the giant safety pins, but now hung below my bikini top. 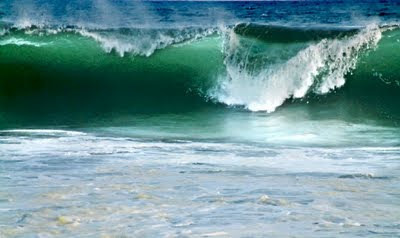 Before I had a chance to tuck them back in, a wave slammed into me and dragged me out, then whirled me to shore again. When I stood this time, the padded inserts and the giant safety pins were gone. I spent the rest of the afternoon lounging on the sand in all my unpadded and crumpled glory. We ate dinner there, a round fish cooked by a little old lady over a campfire. It was time to head home. We'd planned a visit to Guadalajara, where Arturo had relatives. We stayed in that first night, but the next evening we went out to an upscale nightclub. I wore my glamorous purple outfit. They wouldn't let me in because women weren't allowed to wear pants! The guys argued vehemently with the management in Spanish and I was finally allowed entrance. It occurs to me now that they may have bribed them. The music was love sung by an older gentleman whose name I don't recall. The lyrics were filled with longing. He closed his eyes while he sang. His posture and every wrinkle on his face expressed loss and regret. Spanish was the language my grandparents spoke, but I wasn't fluent. Still, his meaning was clear: Love while you can and hold onto it for as long as possible. Donald laid his head on the table. He'd become more solemn as our journey progressed. It was he who held my hand when I became ill on the drive home. I'd had the warning signs of La Turista for several days but was too embarrassed to tell the guys. Student health back home said I didn't have anything ominous in my system and expressed wonder and chagrin that I'd nonchalantly bathed in a stream, eaten food from street vendors and drank the untreated water in Mexico. Hey! I was having an adventure.